As a Catholic organization, we aim to be humble in our work — you won’t see CNEWA’s name stenciled on massive crates of relief supplies, or on warehouses or schools. Sometimes, though, it’s nice to be recognized for our efforts — as we were today by Charity Navigator, America’s largest independent charity evaluator. We received their coveted rating of 4 stars! To our wonderful donors: thank you for your ongoing and generous support. This news demonstrates our commitment to sound fiscal management, accountability and transparency. Your trust is crucial to us, and we never take it for granted. You can see our detailed rating here. Picture of the Day: Smile for the Camera! Most of the Assyrians and Chaldeans living in Georgia are descendants of refugees from Iran. They came to Georgia at the beginning of the last century, as life had become very difficult for them. People died of hunger, exposure, and unbearably difficult conditions. In spite of the obstacles, however, thousands of refugees managed to reach Transcaucasia. I know how important faith was for them. My long suffering people proved it with their lives and sacrifices. In the life of every Assyrian and Chaldean, wherever they find themselves, no matter what fate has thrown at them, there has always been something unshakable. These strong people resisted pressure, oppression, violence, cruelty and injustice. And what made them survive, what enabled them to endure, was something far stronger than a sense of national self-preservation. It was — and it remains — their Christian faith. They have prevailed because of the Gospel. After the collapse of the Soviet Union, Assyrians and Chaldeans in the revived and independent Georgia were grateful to live in a country with deep Christian traditions, and they gradually regained hope for a peaceful existence. But these hopes were sobered by the realities and results of life after 70 years of Soviet rule, during which society was in a severe informational vacuum. At that time taboos and prohibitions were an integral part of life. These extended to all spheres of social and state activity, including the practice of religion. Information about religion was scarce and, in most cases, unreliable. While the Communist Party no longer openly persecuted the church, it mocked clergy and actively discouraged religion and the practice of faith. Decades of this numbing activity made clear the priority of our mission: to reaffirm, reassure and support those holding on to their Christian faith. We learned that it was vital to hold frequent meetings, conversations on religious topics and to help explain Christian doctrine, so that the faith did not remain something distant or merely a part of history. And so we began working to make Christianity an integral party of daily life — a code of conduct, a way of living rooted in love. The primary objective for our mission has always been, and will continue to be, to live and witness the teachings of our Lord, Jesus Christ, through Scripture; we draw together communities for the celebration of sacraments and feast days; we foster love and charity among the people; we teach the faith, ethics and morals of the church; and we support the practice and preservation of our cultural heritage. Read more in his Letter from Georgia. 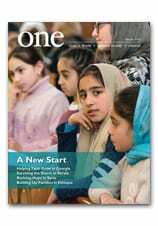 The March 2019 edition of ONE is now online. We’re pleased to announce that the March 2019 edition of ONE is now online. Check it out! Ethiopia…where the church is involved in strengthening marriages and uplifting families. All these and more can be found in the March 2019 edition of ONE. The digital edition is viewable at this link and the magazine itself will be arriving in mailboxes soon — bringing to your home the acclaimed journalism and stunning photographs that help to show so vividly how CNEWA is making a difference in the lives of many around the world. For more, check out the video preview from our president, Msgr. John E. Kozar, below. We couldn’t do it without you. Thank you and God bless you! “Greater cooperation and a generous commitment by Christians all over the world to their brothers and sisters of the Holy Land and the Middle East is needed,” it said in its annual appeal, which the Vatican press office published on 28 March. In a letter sent to bishops around the world, Cardinal Leonardo Sandri, congregation prefect, asked for continued support for the traditional Good Friday collection for the Holy Land. The collection, taken up at the request of the pope, is administered by the Franciscan Custody of the Holy Land — an administratively autonomous province of the Franciscan order — and the Congregation for Eastern Churches. The congregation monitors how all funds are used and supports projects in the Holy Land, Cyprus, Syria, Lebanon, Egypt, Ethiopia, Eritrea, Turkey, Iran and Iraq. The Franciscan Custody is responsible for most of the shrines connected with the life of Jesus as well as for providing pastoral care to the region’s Catholics, running schools, operating charitable institutions and training future priests and religious. Part of its emergency funding efforts to Eastern-rite and Latin-rite dioceses in the Middle East, the congregation said, includes helping Iraqis and Syrians who are slowly returning to their homelands, as well as their fellow citizens still living as refugees. “In order to assure the proper means necessary for a dignified life for those who return to Iraq and Syria and those who found refuge in surrounding countries like Lebanon and Jordan, the collaboration of all people of goodwill is needed,” a note from the congregation said. Most of the collection goes to the Franciscan Custody. Of the amount earmarked for the congregation — which was 8.6 million euro (more than US$9.6 million) last year — went toward: the formation and support of seminarians, priests, religious and laypeople; educational activities for students in the Holy Land; assistance to churches in the Middle East; and emergency aid and extra spending for Iraqis and Syrians, the congregation said. A detailed list of the projects supported through the funds given to the Franciscan Custody included assistance to the Christian minority in the region, providing pilgrims access to the archaeological sites and Christian shrines and supporting education. Among the maintenance and restoration work carried out were projects at the Church of the Nativity in Bethlehem, the Church of the Holy Sepulcher in Jerusalem, the Basilica of the Annunciation in Nazareth and the Church of the Transfiguration on Mount Tabor. The collection also helped fund activities and educational grants for young people in the Holy Land, housing and small business projects there, as well as emergency aid to Syrians and Iraqis. On the road outside Rableh, Syria, visitors see the extent of the damage from years of war. To better assess and evaluate the current situation in Syria — now that the regime’s forces have regained control of more than 75 percent of the country and secured the major cities and rural areas — CNEWA-Pontifical Mission visited our partners so as to touch base with the beneficiaries of our aid and the volunteers who are work on behalf of the church. Our plan was to visit three areas: the capital of Damascus; the central city of Homs and Tartus on the coast; and finally, Aleppo, where we were asked to participate in a special synod of the churches organized locally to discuss the challenges facing the Christian community there, once the largest Christian community in the Middle East. Unfortunately, the visit to Aleppo was canceled for security reasons. On the same day we were scheduled to travel there, heavy shelling targeted downtown Aleppo. Nevertheless, we were able to follow the work of the meetings and we were updated on the findings and recommendations. Military attacks continue to decrease, especially since the areas under the opposition or the extremists are now very restricted to one area in the northwest of the country (Edlib and the surrounding area, controlled by the extremist militia of Al Nusra) and the northeast (east of the Euphrates River under the Kurdish militias supported mainly by the United States). However, this stability should not be confused with long-term peace, which some question as doubtful. Some observers fear fragmentation and the ethnic cleansing of areas that fall either to government or Kurdish control. This could spin out of control, for example, should both parties face each other in battle around Deir Ezzor. This is particularly dangerous, as each side is backed by different outside powers. The territorial defeat of ISIS does not mean it will cease to exist. Rather, it is likely to adapt its strategy, continue underground, and use more guerrilla and terrorist tactics. The problem in Syria is not just ISIS, but the lack of inclusive governance and equal opportunities in the country. These are the root causes that enabled ISIS to grow. The organization is not a cause but a consequence of the underlying political situation. As a result, the defeat of ISIS will not lead to the end of the conflict in Syria. If the root causes are not addressed, the conflict is likely to continue. In addition, new conflicts and new extremist groups might arise. On the other hand, in the aftermath of the war and with the absence of a clear and united opposition, any political process without a clear strategy carries risks. A power vacuum — or political, ethnic or sectarian tensions — could become a source of renewed conflict, which may lead to the further destabilization of the region. Socially and economically, the humanitarian catastrophe in Syria — and the resulting rupture of socioeconomic ties inflicted on the nation’s economy — has seriously damaged the infrastructure. It has reversed or significantly slowed not only the development of Syria itself, but also of its neighbors — first of all Lebanon and Jordan — as well as Turkey. This has exacerbated the situation in these states and has created new risks. Security and socioeconomic conditions. Economic sanctions against Syria and its ally Iran impact directly the situation for Syrians on the ground. For there to be any improvement, sanctions must be eased, if not lifted altogether, reported local church leaders. The severe shortage of basic supplies, such as electricity, fuel and gas, has made it difficult to produce and export products for external markets, cutting off Syria from the flow of cash and imports. Until there is a change in the status of sanctions, post-conflict life will be much harder on the remaining population and will delay the return of the more than 5.6 million Syrians registered as refugees outside the country. During our visit, we were in contact with school teachers and other civil servants who reported that their salaries have lost most of their purchasing power, falling more than 800 percent, from $600 per month before 2011 to $72 in 2019. And when we inquired regarding the need to continue with some emergency activities, we were told that sometimes even buying a bottle of vegetable oil would represent a challenge. More seriously, others informed us that some people lost their lives because they were not able to pay for the cost of dialysis treatment, which costs on average $25 per session. Access to property and assets. Law No. 10 of 2018 established the concept of “renovation zones,” which put conditions on residents who want to return to their properties. They must present their deeds or proof of ownership within a certain short time period, or risk losing everything. Knowing that already many deeds were lost, the public perceived this step very negatively and many consider it a threat. There is much uncertainty. Amid all the violence of the world, religions must be factors of peace, Brother Alois Leser, prior of the Taize community, told Christian and Muslim young adults from 43 countries. More than 1,600 Muslims and Christians gathered in Beirut to celebrate the feast of the Annunciation on 25 March in a ceremony punctuated by songs, prayers, reflections and speeches. They were encouraged to respect others to foster genuine interreligious dialogue. The Beirut gathering was part of the 22-26 March International Ecumenical Youth Meeting, organized and sponsored by the churches of Lebanon, the Middle East Council of Churches and the monastic Community of Taize. For the Annunciation encounter -- at which participants observed a minute of silence for victims of violence around the world -- the young people were joined by various Muslim religious officials and clerics; Lebanese government representatives; the papal nuncio; Christian and Orthodox prelates and religious; and brothers from the French-based Taize ecumenical community. Lebanon has observed the Marian solemnity of the Annunciation as a joint Christian-Muslim feast and a national holiday since 2010. Brother Alois’ speech was followed by a Muslim girls’ chorus singing about the Annunciation. Sabine Adrien, a 28-year-old Catholic who participated in the meeting with seven other young adults from Lyon, France, told Catholic News Service: “I loved the gathering, especially the prayer between Christians and Muslims. It was very simple and beautiful, all of us praying together around Mary. Workshops and sessions at the ecumenical meeting -- at the main seaside event venue as well as in various churches in Beirut -- focused on issues related to coexistence and interfaith dialogue, as well as rituals and traditions of the Eastern churches. The relations between the Taize community and Lebanon date back to the early 1980s, when the late Brother Roger Schutz -- who founded the monastic community in 1940 -- visited the country as its civil war was still raging. “We believe and see that the power of peace in this country is stronger than anything else,” Brother Alois said.